I am in a bit of a muddle today, it has been so busy that I need a holiday……..we have B and B guests here ~ really lovely people, so it was an early start; prepare breakfast, get the hens out, serve breakfast, clear away, hang towels and bath mats out, clean bedrooms, make our lunch, pop out to buy food for tonight’s meal including B and B guests too, prepare meal for seven people, cook it, set the tables, serve it, chat and have a wee drinky poo, clear it all away, load the dishwasher for load one, set the breakfast table up, put the hens away, unload dishwasher load one, load up dishwasher load two, chat and have another drinky poo, suddenly remember that I still have my washing on the line ~ drat……..and finally go completely and utterly barking mad! So, my post today will be short and sweet as I am completely bushed ~ but I will be back tomorrow with more ramblings and musings, plus I have a lots of new photos and recipes to upload and share. 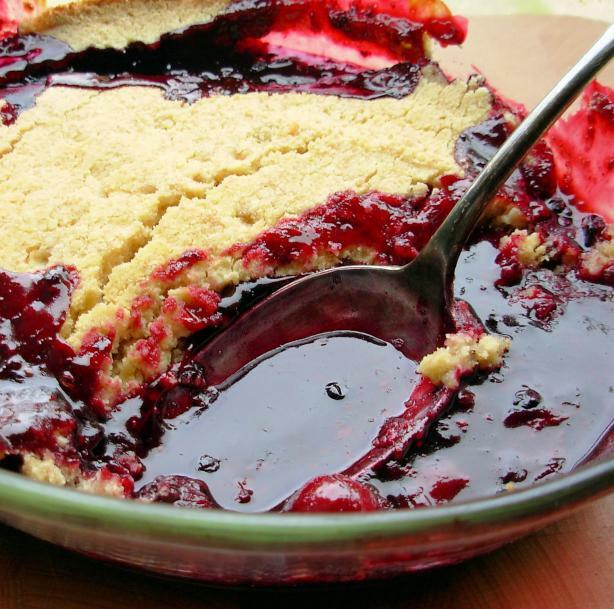 What I would like to share with you today is a recipe that is a FIRM favourite with all of my guests, friends and family, and, it is a wonderful end-of-berry-season recipe……a Summer crumble that will seduce you into the mellow, misty and fruity days of Autumn. A Jumble Berry Crumble with a Shortbread Topping, a recipe born of odds and ends of assorted berries lounging forlornly in my freezer, a bit of a muddle like me today. Serve this with cream or custard, or even a scoop or two of vanilla ice cream for a delicious ending to any gathering. 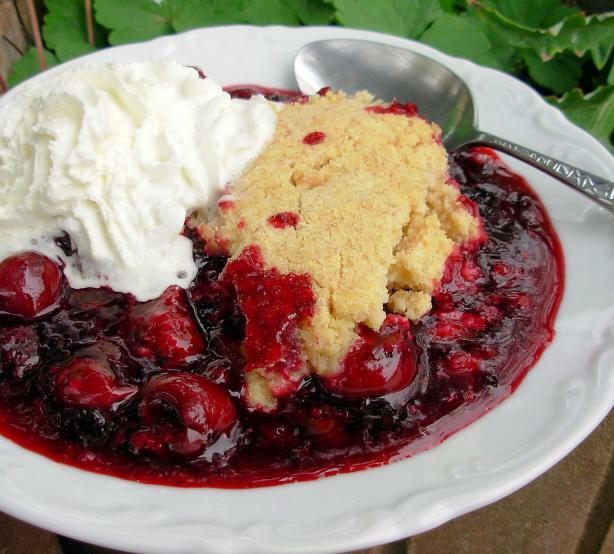 Any berries will do, I have made a few suggestions below, the star of this crumble is the shortbread topping ~ a firm and buttery hat for a jumble of glistening berries……. This was a quick throw it together Sunday Lunch pudding idea – raid the freezer for all the nearly used bags of frozen summer fruits, such as cherries, raspberries, blackcurrants, redcurrants, bilberries (blueberries), blackberries and strawberries. Fling them all into an oven-proof gratin dish; whizz up a shortbread crumble topping – and Bob’s your uncle and Fanny’s your aunt, as we say down our way! We loved it, the combination of fruits was wonderful – and it is a great idea for using up whatever fruits you have lurking in your freezer. I am sure that fresh fruit would also be suitable. We like our fruits to be on the tart side – so pleased add sugar to taste. Serve the crumble with hot custard, cold custard, cream, ice cream, crème fraîche or whatever takes your fancy. You will also need a shallow oven-proof baking dish with a diameter of 9 inches (23 cm), 11/2 inches (4 cm) deep. First, make the topping. All you do is place the sifted flour, butter and sugar in the processor and give it a whiz until it resembles crumbs. If you don’t have a processor, place the flour in a large mixing bowl, then add the butter and rub it into the flour lightly, using your fingertips. Then when it all looks crumbly, and the fat has been dispersed fairly evenly, add the sugar and combine that well with the rest of the ingredients. Now arrange the mixed fruit in the dish and sprinkle over the sugar to taste, then add the crumble mixture, spreading it out all over the fruit with a fork and pressing down firmly. Place the crumble on a high shelf in the oven and bake it for 30 to 40 minutes until the top is golden and crisp. Serve with chilled pouring cream, custard, whipped cream, crème fraîche or vanilla ice cream. See you later, when I will be refreshed and calm……I am off to assume the lotus position and meditate. I can see the frenetic pace you had.. It must be fun to have a B & B..
YES… I WANT TO SEE YOUR B&B AS WELL… give the people what they want!!! I have zero talent at a consistent pie crust. I believe crumbles were invented just to cover my ineptness. Your dessert looks so delicious! The fresh berries sounds really good baked with the topping! oh karen…you are busy, my friend…this looks so delicious…. love letting the hens out…wish i was there for a drinky poo with you !!!! What a wonderful post. 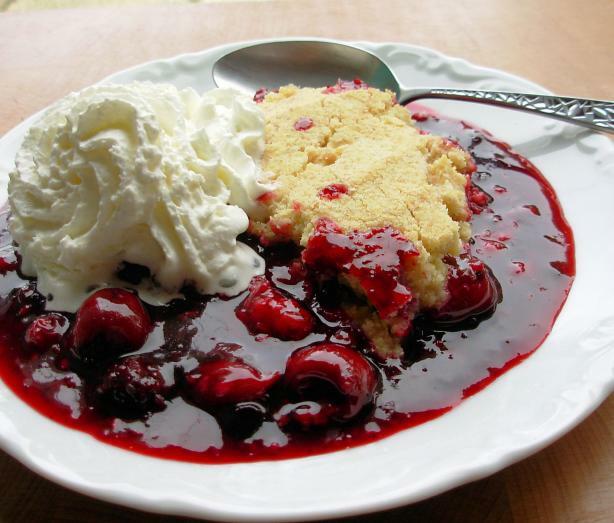 Your crumble looks delicious and is matched only by your stellar writing ability. Thanks Monique ~ I will post some photos of my B and B soon ~ here is where you can read about it for now! You have a great weekend too Heather and carry getting better too! Thanks Kitchen Flavours ~ for my sins, I have dinner guests tomorrow…..LOL! But Sunday will be my day of rest! Have a wonderful weekend Kary and Teddy! Mary ~ many thanks for your very supportive and kind comments! It looks fabulous Karen.Just lovely!And I have seen the food! Hi Karen – Your posts are a delight to read and I can see you bustling around your home at top speed trying to get your day's work done. I would stop for an occasional wee drinky poo too. 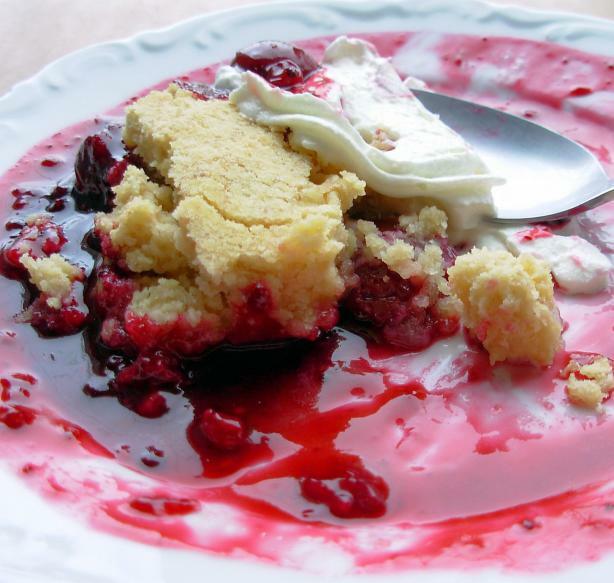 Love the shortbread crust you used on your wonderful crumble. Thanks Cathy! Yes ~ I am a bit of a bustler!! But today is my day off!